When Jane emailed and said it was time to book a streamer trip, I was up for it and knew she was as well. Jane has been fishing with us for several years and loves to get outside. The weather, over the previous weeks, had been less than perfect. But, today it was as good as any day we could remember in January. Sunny and not a cloud anywhere. No overcast with a slight breeze and warm enough for shorts during the warmest part of the day. Another reason it was an exciting day is because Jane loves to streamer fish and has accuracy to hit spots as good as anyone who has stepped up to the casting brace. The day was shaping up to be a good as we pushed the boat off the trailer. A short time later we were dodging flying metal, from other boats and bank fishermen, in the discharge. We fooled around with the skip jack for a while, but Jane's eyes were on the rocks and the fast water along the bank. This meant it was my job to hold the boat in the discharge while she banged the streamer off the bank, then retrieve the fly and five feet later we d it again. Add wakes from power boats, tying flies without losing good water and keeping an eye out for flying metal, we were both pretty busy. This went on for a time. The browns came out to play again on this trip and attacked a Zoo Cougar with the intent to kill it. The fight was on with Jane winning the battle, while becoming comfortable with the new TFO-BVK from Cumberland Transit and Airflow sinking line. Throwing the full sinking line is something that takes a little getting used-to. But, once the angler figures out how to let the rod work with the line and not try to over-power the combo, life gets better. We fished the banks pretty hard behind some other boats. When the fish started hitting the top, we switched over to top water and fished some real big top water flies on a floating line. It did not take long for Jane to hook up with another brown. The thing that the seemed to be the ticket was letting the fly begin to sink and then put just a little tension in the floating line. The brook trout are showing up on most trips lately. They are still gaining their river color and by Fall, if everything goes well, we should see some brook trout with some of their well known vibrant colors. The brookies can make a trip some days. The one in the picture above was just under 14" and just couldn't resist a shad pattern I had worked up the evening before the trip. We met some very nice folks on the river, including a couple land owners who were out enjoying the day too. The beavers have been working hard over the Winter and so have the other animals who call he riverbank home. We are running a special of an all day trip at half day prices. The days are still short and we don't stop for lunch, we keep on throwing the big stuff so just bring a sandwich and go for it. Ice and snow met Steve, Mark and myself on our trip to the river. We launched on partly cloudy skies and a whopping 24 degrees. Hoping the weather guessers were correct we kept an eye toward the sky for breaks in the clouds. The sun was peaking before we hooked up with the first Tennessee Tarpon. The US Army Corps was running two generators when we got on the water and turned them back to one shortly after. They also changed the generator as well, so the favorite boat position didn't work as well and we began a search for just the right spot. It didn't take long before Steve and Mark were into the fish and the action got pretty darn good. TN Tarpon are a lot of fun to chase. 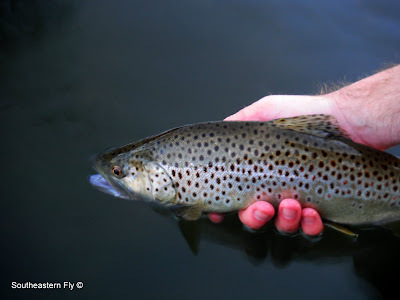 Since we support catch and release these fish are a great way to warm up the casting shoulder, before moving onto the main course of the river. These fish have some high flying acrobatics that are at times just short of spectacular. They make blistering runs and it is easy to tell one of them has been fooled by your offering when the headshakes are seen in the rod tip. We could have spent more time fishing for these fish,but it was time to move on for the browns and rainbows. The browns are making a comeback in the river. With plenty of food to chase they were more active on this trip than any trip this year. We tried a few different colors and several patterns throughout the day. We tried to keep the fish looking and sometimes just experimenting with different flies. The key is to be persistent and continue throwing the flies at every chance. I expect to catch a fish on every cast, not that it happens on every cast, but it does keep me ready when they the fish do turn on. Gary, Dan and I set out for a fly fishing float on the Caney Fork. After the last Caney Fork float I was very optimistic with thoughts of big fish on big flies. The first stop was for skip jack (TN Tarpon) and we made the early row for just the right spot. We stopped the drift boat and got it in the right position. Gary and Dan went for the fish, but they were not responding to last week's hot fly. Dan began searching for the right pattern and he struck first. Soon we were on skip jack that were hitting every cast. I got in on some of the action as we all swapped out and finally got tired of catching. Another "trick" is the retrieve. These fish short strike a lot, but if you just keep stripping the fly and don't try to set the hook with the rod, they will give you three sometimes four strikes per retrieve and sooner or later they are hooked. We boated brookies, rainbows and skip jack. But, it was getting late in the day and the big browns were still not showing. We fished the middle of the river through several different stretches and picked up some fish. The other species were hanging there, but those browns weren't this time. Finally we tried a bank that we haven't fish, from my boat, in several years. Who knows why we haven't fished the bank? Dan was behind the oars as Gary and tried for that elusive brown trout. After what seemed like several thousand casts and a handful of ibuprofen that brown was on the streamer. The slam was complete. The rainbows don't seem to be growing in length, but they are getting fatter. Right now they are searching for protein and can't seem to pass up a dying bait fish or a sculpin. They will keep searching until Spring when the bugs become their primary food again. The sun started going down and the temps began falling with it. Streamers were the choice of the day and at times the action was fast and furious. Sometimes that action was followed by long, slow periods of discussion and shoulder crushing long distance casts. Streamers can make for a tough and rewarding day. Tough because the action can be slow and rewarding because the strikes usually come from more aggressive fish that want to kill the offering. Now is the time to get there and do it...go for the more aggressive fish in the river. Christmas and New Years are now in the books. It was a good time at our house and hopefully it was a good time at yours as well. During the off moments, I tied flies and experimented with new patterns. Some patterns I even tied and put in the boat. David and I hit the river below Center Hill Dam and immediately the bite was on. We got into some skip jack and browns early on and with streamer rods in hand we made our way down the Caney Fork River. David was in the casting brace and boated the first fish of 2011. The crappie was not only his first fish of the yea and the first fish in the boat for 2011, it was David's first crappie on the fly. The day was shaping up to get interesting. We finally moved on from the honey hole and began pounding the banks. The skip jack were running on the river and although we did not have the preferred colors of pink & white, we did have half the combo and cleaned up with the streamers of choice. The skip jack were fun and we could have probably stayed with them all day, however we were on the hunt for trout and off we went. The water was reasonably clear, especially considering the lake level. The river had a green tint, which is normal....whatever normal is, for this time of year. The flies did not have to land in front of the fish's eyes and they would come off the bottom to eat. This was a good thing because the flies would get to the fish before they could be spooked by the boat as it approached. When an articulated fly travels through the water and the angler stops, the fly will normally break down in the middle. If the head of the fly is made with something buoyant, like this Bank Maggot is made, the head will travel up toward the surface and the rear (without buoyancy) will break and fall. This action is not natural and many times the fish will break away from the fly. One way to assist is by tying in additional material and another is shorter-faster strips. We got off the river just in time. Because, yesterday the Army Corps dumped water from Great Falls and open up the generators at Center Hill. Our day was done, but not before we learned more about streamers. If you would like to learn more about fishing the marabou and bucktail, let me know. I am considering a streamer class to teach some of the basics and a few of the fundamentals of a great way to spend time on the river. I made a last minute, last trip of the year run down to the Elk with some friends. I wanted to try out a new underwater camera and catch a few fish along the way. The things I learned from this trip were many. I tried a few different flies, some worked and some are now in the trash, because I didn't like them when I tied them... confidence in the fly goes a long way. The Tenkura lasted through a short walk downstream and then I switched to some midge patterns. Soft hackles produced a couple strikes and finally it was back to a nymph. After the break, the nymphs continued to produce, so I added an attractor midge above it. The midge was about a foot above the nymph and with a few adjustments it was game on again.